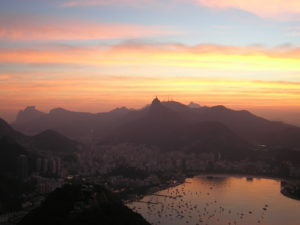 One of the biggest Rio attractions is the Sugarloaf. Here the view from the top just after sunset. In this section I have put together some info on the biggest sights in Rio de Janeiro. On the specific pages you have much more detailed information with links to sites, addresses and much more. Much of the information posted here is prone to change, of course I always try to keep it up to date but in case you would find an error… please let me know (you have the Contact button in the menu for that). So I organized my pages in two main sections. The first one is Rio de Janeiro Attractions, here you have info about the Christ Statue, The Sugarloaf, The Botanical Gardens, Tours, Football Games in Maracanã stadium and more. In the second section I deal with The Beaches in Rio de Janeiro, here are links to many pages with detailed information about the various options around. The beaches are described from historical perspective and hopefully this will enrichen your experience of them. Also has a take on the particular beach culture and what to wear. The fact is that I have not got the sights of Rio covered at all on these pages, there is plenty of more things to do that are worthwhile. In the Sports and Surfing Section as well the Other Info sections you have quite a few good tips on activities. Actually things to do are spread out pretty much all over the site if you would care to have a look. Anyways I hope by putting these texts together I have been able to provide you with something useful, feedback is always welcome!